Fairy Tales are not just for kids. Welcome to this week's Writing.Com Fantasy newsletter, where we explore what might be, if we look just past the corner of the eye. 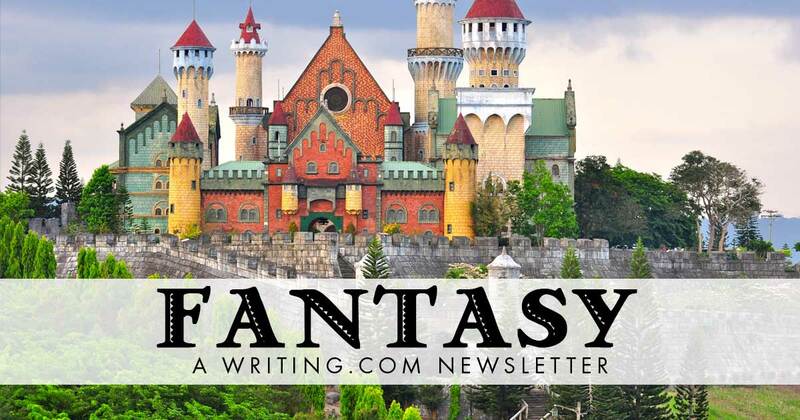 Greetings, I am honored to be the guest editor for this issue of the Writing.Com Fantasy Newsletter. I believe that all creative writing, be it poetry or prose, has an element of fantasy. We write what we know, perceive, and imagine. With all the definitions and forms of the word 'fantasy', note that each definition begins with the word 'imagination'. Is that not what we writers do? ~ Observe, perceive, or visualized an object, emotion, situation, and with pen/pencil, or keyboard, use words to develop a story or a poem that relates that observation, perception, or vision. One of my favorite types of fantasy stories are fairy tales. Though the term fairy tales was first coined in the 17th century to define conversational salon stories (Tales of fairies, by d'Aulnoy), for adults, fairy tales have a long history as literature and oral folktales. Think about it, Aesop's Fables (6th Century BCE), Chaucer's Canterbury Tales. Perhaps the best known fairy tales are those compiled by the Brothers Grimm. These began their collected life in print as a collection of oral folktales, originally written in the early 1800s, where the Brothers Grimm sought to preserve the characters and plots of oral German folk tales in written form. In later editions, the stories were edited to make them more suitable for children, so that today's common image of the child's fairy story became defined, along with the coinage of a happy ending, as having a 'fairy tale ending'. The Fairy Tale continues its evolution today (for adults and kids both), while also holding fast its original and common literary image. American Heritage Dictionary defines a fairy tale as both “1. A fanciful tale of legendary deeds and creatures, usually intended for children,” and “2. A fictitious, highly fanciful story or explanation,” - not just for kids..
Fairy Tales today are read and told today by adults and kids alike. From nursery rhymes (often a child’s first exposure to literature), to some manga (one of my faves, “Sandman”), and individual stories worldwide, creative authors of poetry and prose incorporate at times elements of oral history, science, local color, images, comics, film, manga, along with myth and fantasy. Why can't they move to a gated community? It's not Jack's fairy-tale ending. A poem about the original fairytale story: "The Princess and the Pea." Princesses in fairy tales should have a say in who kisses them. A modern-ish fairytale with the theme of mental health. Generated in 0.69 seconds at 6:09am on Apr 25, 2019 via server WWW1.